7 For we walk by faith, not by sight. 8 We are confident, yes, well pleased rather to be absent from the body and to be present with the Lord. 9 Therefore we make it our aim, whether present or absent, to be well pleasing to Him. It was a harrowing time when my sons were learning to walk. My oldest was determined from the beginning to stand on his own two chunky feet. Staggering from chair to couch to table, he’d continue to lurch and reel until he’d tumble to the ground. Bruised-yes. Vanquished-no. The process continued, day after day, bump after bump, until one day, at the age of nine months Erik could walk. Learning to walk by faith is also a process. We fall. Bumped, bruised, and hurt-yes. Vanquished-no. We are not beaten because we fall; we are only beaten if we refuse to rise. We get up and try again. We learn to walk by faith. 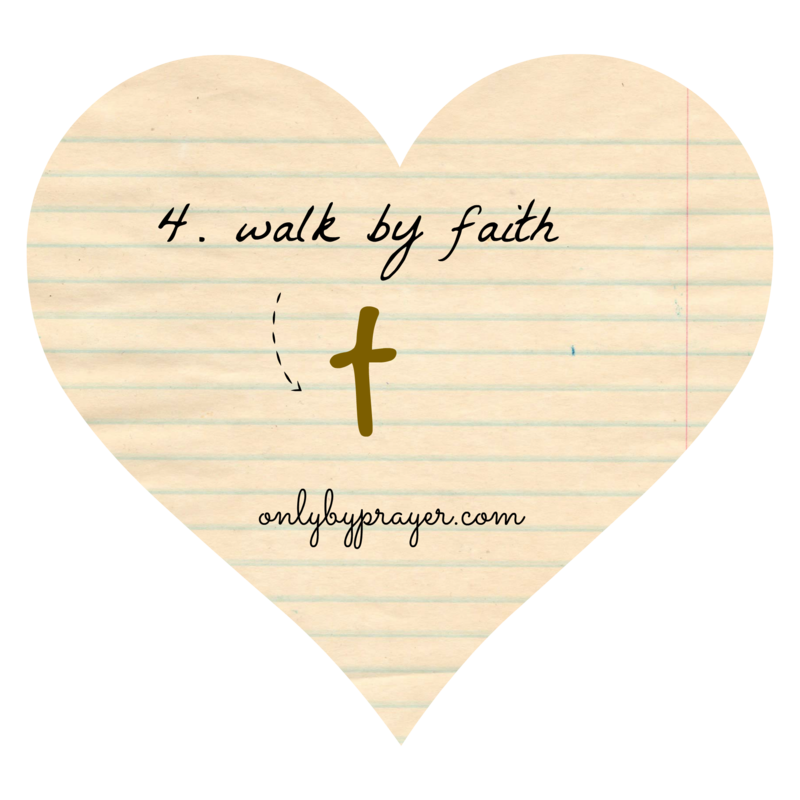 What does a walk of faith look like? A walk of faith looks like a series of good decisions based on the truth of God’s Word. Walking by faith is obeying God when it’s easier not to. Walking by faith is usually scary, uncomfortable, and involves stepping out of the usual. But I have to tell you, I have never regretted a single step of faith. How do we avoid walking by sight? By keeping our eyes on Jesus, the author and perfector of our faith. 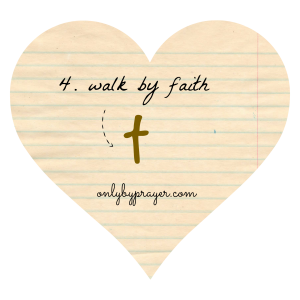 What is the outcome of walking by faith? The faith of others grows. 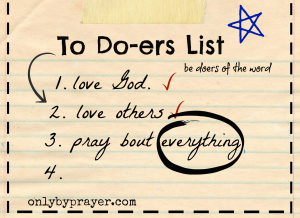 We are entrusted with greater work. The greatest benefit of walking by faith is listed in verse 9 … we please our Father. 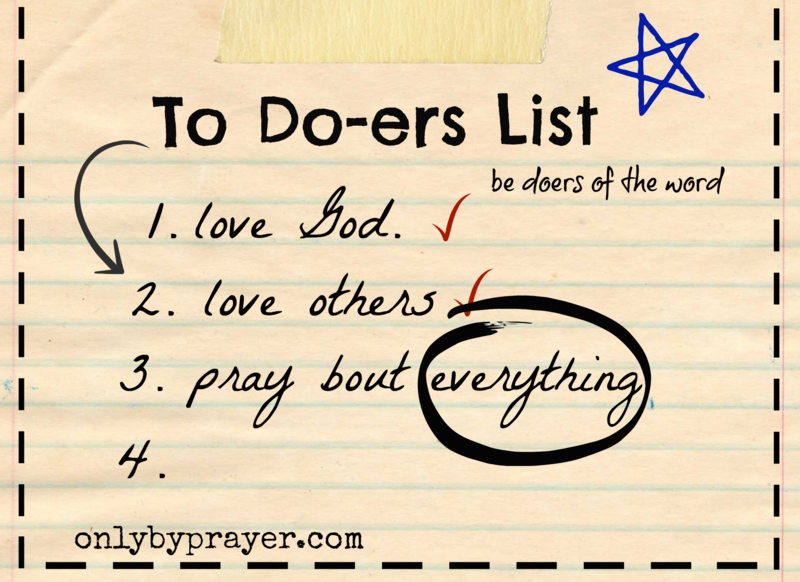 Make decisions based on faith; not fear, not feelings, not the usual. When faced with a decision today ask yourself, What would a faithful person do? And do it. For ideas on how to walk by faith, please check the resources below. Please take a moment to pray and ask God for His strength to walk by faith. Don’t forget to leave a comment in the comment section below. Have a blessed day! Missed a day? Don’t worry. Just click on the links below!